Pinz Pinz Pinz PLUS competition! We received some lovely cupcakes in the post recently, unfortunately not the edible sort, but none the less it was a delicious package from Pinz Pinz Pinz. Pinz Pinz Pinz were established in June 2000 in London and are at the forefront of manufacturing and retailing hijab pins. They have the biggest collection of retail and wholesale hijab pins on the web claim to not only be of great value but also exceptional quality. The cutest content of the parcel was the cupcake pin cushion. Ive been meaning to get one for a while and this is great in both size and appeal. It had a wafer like stick on top, I wasn’t too keen on this so cut it off, however apart from that I love it, Ive been using it for a couple of weeks and it can fit a great amount of pins and looks great on the dressing table. The cute flower pinz are are also available to purchase from their website and add a cute addition to any plain hijab or even on the side of a blazer or jacket. 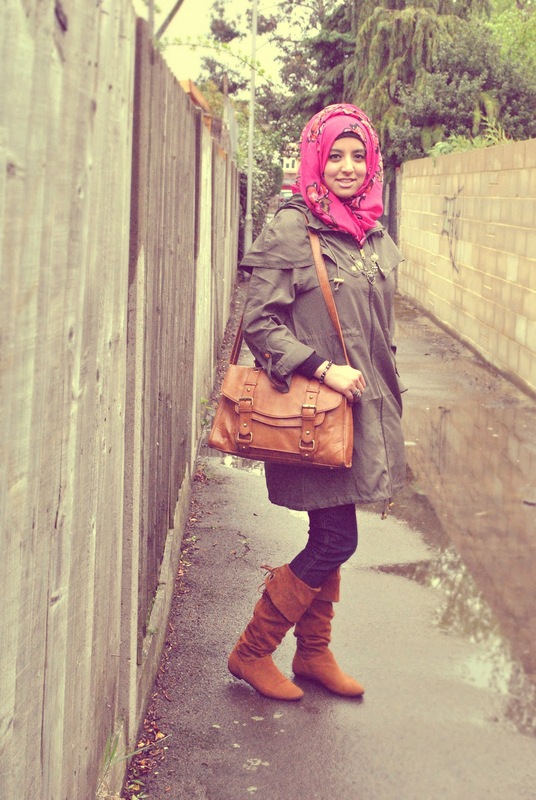 This hijab is made from a chiffon like material and is very large is both width and dimension, the light and airy fabric is not slippery which is a great bonus as you can wear it with or without a underscarf and its material allows you to volumise it quite easily should you not choose to wear a flower clip. Its striking in detail and very easy to drape.I really liked the detail on the flowers. As we are experiencing the glory of the April showers this month and it seems to be raining every day we bought a really light and airy parka jacket,this slips easily into your bag and you can wear it over anything you wear. The festival look is likely to be fashion trend this summer and this is a must have if your thinking of camping or attending a festival. I teamed it with some tan suede boots which are not ideal in the rainy weather but very comfortable. I LOVE LOVE LOVE THIS brooch. 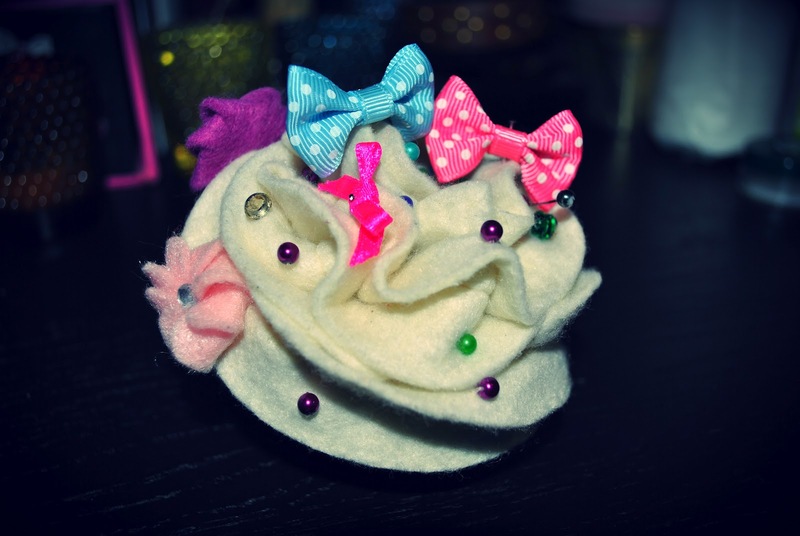 This is the ‘vintage inspired double brooch’. 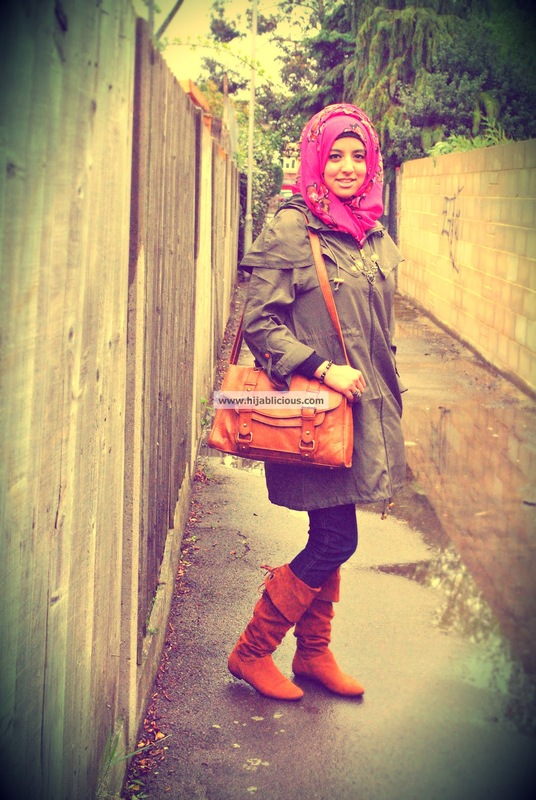 I wasn’t sure at first whether to wear this on my hijab, but then thought it looked very nice across the jacket. It not only adds a bit of bling but easily dresses up a plain outfit, I’m confident it would look even nicer on the side of a hijab.